Showcase of Student Success speakers during the Spirit of Philanthropy included: (Back Row, Left to Right) Austin Haus, Taylor Webster, Seth Reynolds, Nate Niehoff and Macy Gard. (Front Row, Left to Right) Liz Weber, Ana Aquino, Tiana Lyell and Paige Gray. Indiana University East students welcomed community supporters to campus in appreciation of their contributions toward scholarships, internships, leadership experiences and community service opportunities. Guests were invited to the Spirit of Philanthropy Luncheon held September 28 in the lobby of Whitewater Hall on campus. Ana Aquino is from Richmond, Indiana, and is a junior majoring in biochemistry and Spanish. She is a member of the Student Government Association, vice president of Circle K International, an Admissions Ambassador, a supplemental instruction leader, a bilingual literacy coach, and a barista at Brewfus. She co-organized the Hispanic College Night at Richmond High School and will speak about her IU East experience as a Latina. She is a first-generation American and first-generation college student in her family. Aquino has studied abroad in Costa Rica for three weeks with a Spanish language and culture course, and she was able to present research at a conference. Macy Gard is from Richmond, Indiana, and is a junior majoring in human life science with a minor in chemistry. She is part of an alumni Legacy Circle family with her mother, brother, and sister graduating from IU East. Gard is a member of the Student Activities Advisory Team (SAAT); treasurer of the Student Government Association; president of Students Today, Alumni Tomorrow (STAT); a member of Pack Attack; a peer mentor in a First-Year Seminar course; and she is a work-study for the School of Natural Science and Mathematics academic advisors. Gard spoke about doing astronomy research with Wes Tobin, assistant professor of physics, and working as Rufus the Red Wolf’s handler at campus and community events. She also shared about working alongside SAAT to plan student activities and events with the Office of Campus Life. Paige Gray is from Hagerstown, Indiana, and is a senior majoring in business administration with a concentration in managerial accounting. Gray is in the Honors Program, vice president of the Student Government Association, a member of the Institute of Management Accountants Student Chapter, and she works as a work-study for the Office of Athletics and the Honors Program. Gray has presented research at multiple Mideast Honors Association conferences, and has most recently studied abroad in China with faculty members Lee Zhong, associate professor of economics and finance, and Kristoffer Rees, assistant professor of political science. She spoke about other opportunities offered by the Honors Program including the trip to Stratford, Ontario, for the Shakespeare Festival. She also shared about her work with Tim Scales, senior lecturer in business, on her senior thesis that brought 50 IU East graduates back to campus to interview about their work as entrepreneurs and leaders (related to IU East’s upcoming 50th anniversary and the IU Bicentennial). Austin Haus is from Hagerstown, Indiana, and is a junior majoring in humanities with a concentration in music. Haus played an original piano piece, titled Eclipse of Hope, at the luncheon. Tiana Lyell is from Indianapolis, Indiana, and is a sophomore double majoring in secondary education and mathematics. Lyell is a tutor for the Math Counts! Program. She is a volunteer in the Math and Science Center, volunteers for Habitat for Humanity’s Women Build project, and various other community projects. Lyell is a member of the local roller derby team, Dire Skates. She spoke about her passion for mathematics education, her journey from Indianapolis to Texas to IU East, and the benefits of being an online student while raising her daughter. Lyell is looking forward to teaching in the Wayne County area after graduating. Nathan Niehoff is from Rushville, Indiana, and is a senior majoring in business administration with a concentration in finance. Niehoff is part of an alumni Legacy Circle family, a member of IU East men’s basketball team, an All-American athlete, a member of the student-athlete advisory committee, a work-study for the Office of Campus Life, and an Admissions Ambassador. He spoke about his experience as a student-athlete, and what it is like to follow in the footsteps of his brother, Devon Niehoff, to play basketball at IU East. He also shared about his internship with First Bank Richmond, and his passion for financial literacy. Niehoff hopes to enter the field of finance upon graduation. Seth Reynolds is from Eaton, Ohio, and is a senior majoring in human life science with minors in chemistry, neuroscience, and psychology. Reynolds is an All-American athlete, a member of the IU East men’s track and field team, an Admissions Ambassador, and he works at the Campus Bookstore. Reynolds shared about his experiences and travel with athletics and how IU East academics and programs have helped him to be successful. Reynolds hopes to enter a physical therapy doctoral program upon graduation. Liz Weber is from Connersville, Indiana, and is a junior majoring in nursing. Weber spoke about her experience as a nontraditional student in starting college for the 4th time since having lived in Ohio, New Mexico, Montana, and Okinawa, Japan due to her husband’s active duty service in the United States Air Force. Weber also shared her admiration for the IU East nursing program for the simulations, facilities, volunteer activities, and faculty who are helping her to become a confident and competent nurse. 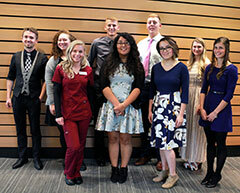 Weber hopes to join medical professionals in the fields of endocrinology or dermatology after graduation, with an interest in one day becoming a nurse practitioner. Taylor Webster is from Richmond, Indiana, and is a senior majoring in political science with a criminal justice minor. Webster was the emcee for the luncheon and is currently the president of the Student Government Association and the Multicultural Affairs Club, an Admissions Ambassador, a scorer for IU East volleyball and basketball, a peer mentor in a First-Year Seminar course, and a consultant in the Communications Center. Webster spoke about her experiences in travelling to Washington, D.C., with a criminal justice course to learn about crime and politics, and her two trips to the National Conference on Race and Ethnicity in Fort Worth, Texas and then this past spring in New Orleans, Louisiana. Taylor discussed how she was able to deepen her understanding of diversity in higher education and bring the knowledge she learned at the conferences to her campus involvement. Webster also discussed her internship with Tiffani Selhorst, head coach for women’s basketball, regarding Title IX in IU East Athletics and the larger excitement she has for pursuing a degree in law after IU East.